Friends of Hemming Park (“FOHP”) is pleased to announce its partnership with the University of North Florida (“UNF”) to launch a unique public art experience that will bring student-created sculpture to Hemming Park. The first sculpture will be installed during the spring of 2019; FOHP and UNF intend that this will be a multi-year project, with at least five iterations. Funding for this project will be provided solely by FOHP, with the support of private donors. Eight sculpture students from UNF have created maquettes – small scale models – engaging in themes of local flora, fauna, and Jacksonville history. The maquettes will be exhibited in the MOCA Learning Lounge and the public will have the opportunity to vote on a “People’s Choice Award” for one maquette. This award will also serve as a vote towards the selection of the winning proposal to be installed as a full-scale sculpture in Hemming Park. In late October, students will present their proposals to a selection panel comprised of downtown residents, business owners and representatives of organizations including JaxParks, the JPL, MOCA Jacksonville, Friends of Hemming Park and the Cultural Council of Greater Jacksonville. 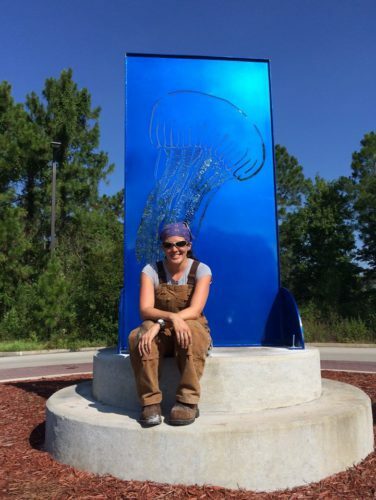 The panel will select one student artist to fabricate a sculpture which will be created under the supervision of Jennifer Hager, UNF sculpture professor, and Lance Vickery, UNF assistant professor of sculpture. The winning proposal will be revealed on November 1, 2018. Really awesome to see Jacksonville so full of artistic progression lately!